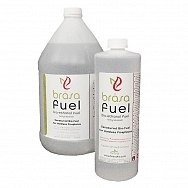 Brasa's own denatured bioethanol alcohol fuel is specially formulated to be one of the cleanest burning fuels on the market. This fuel is a non-toxic, smokeless, odorless, environmentally friendly and renewable source of energy produced from potatoes, corn, beets, sugar and other agricultural products. The only emission produced is water vapor (steam) and very low levels of carbon dioxide.